Every class that you define in C# will inherit from exactly one class. You can explicitly define a base class that the new class inherits from. Or you can avoid specifying a base class when you define a new class. If you don’t specify a base class, the new class will be automatically derived from System.Object. 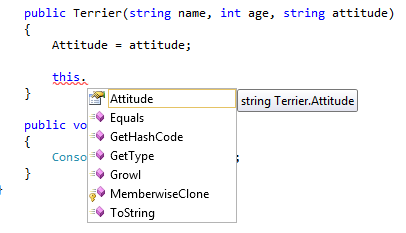 You can see this by causing Intellisense to pop up for an instance of the class. You see the class members of System.Object–e.g. Equals, GetHashCode, GetType, etc.